I've seen these cement finial things all over blog land. Pottery Barn even has one. After reading THIS post, I decided I needed to find a way to make one... as cheap as possible. Since I didn't have a cement finial, I had to improvise. So on a couple of my many thrift store escapades, I found a wood finial, and a bowl. After that, it all came together. The guts of this project- my bowl and finial. Drill a hole through the bowl(the screw will go in better and faster) then screw a screw into the finial. It should look like this. 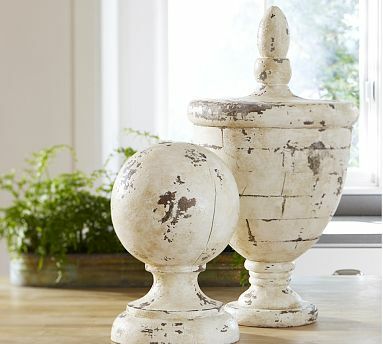 Now, take some spackle and spackle the heck out of the finial. Let the spackle dry. Now, paint the whole thing brown. Don't leave any white showing. Let the paint dry. Next, paint over the brown with white. Be sure to leave some brown showing. I like the one you did better. :D Very creative! This is absolutely amazing! I want to find those wood things to make some! Awesome! That looks really cool. Very clever! I wouldn't have thought to use plaster! Can you smooth out the spackle a little with sand paper?